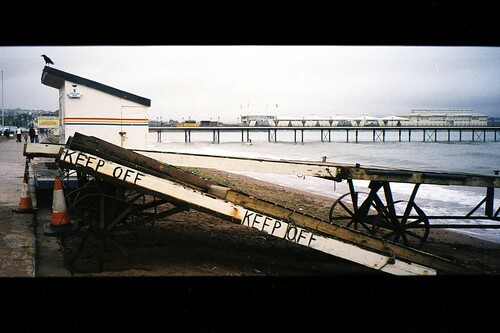 I recently went down to Paignton in South Devon to see me my old mate Garry – we had a splendid day drinking at a Beer Festival and managed to take some decent photographs of Paignton Pier with an old Pentax Espio 120mi. This is point-and-shoot, mid-range, 35mm film camera. The Espio is an autofocus unit with automatic exposure settings and a built in flash unit. One of the most useful applications available on this model is ‘backlight compensation’ setting, which enables you to take a photograph using natural light in the background and flash in the foreground, giving an even tone across the image. Panorama mode is included in this little package which gives a different aspect ratio from most other cameras.